Lakes are changing rapidly today, not because we are separate from nature but because we are so connected to it. But while many of our effects on the natural world are new, from climate change to nuclear fallout, our connections to it are ancient, as core samples from lake beds reveal. 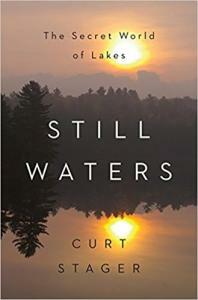 In Still Waters, Curt Stager introduces us to the secret worlds hidden within lakes as he travels from the Adirondack wilderness to the wilds of Siberia, from Massachusetts to the Middle East. For him, lakes are both mirrors and windows into history, culture, and our primal connections to all life. Stager fills his narrative with strange and enchanting details about these submerged worlds? diving insects chirping underwater like crickets, African crater lakes that explode, the growing threats to Thoreau’s cherished pond? while emphasizing how beautiful and precious our lakes are, and how, more than ever, it is essential to protect them. "Mr. Stager’s curiosity and erudition, along with his self-effacement, work in his favor. As does his lyrical imagination, which informs his view of lakes as places of illusion, a crossroads of myth and reason." "This contemplative volume, both informative and poetic, makes good on Stager's intent to 'upgrade' Walden 'for our own century.'" "An outstanding work of nature and science writing that lingers long after the book is closed. Highly recommended."